[prMac.com] New York, New York - My Pope Philippines, which celebrates the lifestyle and values of the beloved Pope Francis, is now available on Magzter, the world's largest digital magazine newsstand. Published by Indochine Media Philippines, the magazine is dedicated to being the monthly source of inspiration for readers from all walks of life. My Pope Philippines is filled with stories that highlight encouraging developments in the lives of Filipinos - positive and game-changing Filipinos whose values and actions reflect the same ones Lolo Kiko stands for. The magazine will feature good news, inspiring stories, traditions, arts & crafts, everyday heroes and much more. And as Pope Francis always emphasizes the importance of community, My Pope Philippines also includes the miracles - both big and small - that readers have experienced in their own lives. In the latest issue of My Pope Philippines, read about the pope's favorite meals, and discover the hearty dishes his mother used to cook when he was growing up. You can also take a whiff of the freshly baked bread from the Vatican's bakery, marvel at the harvest from the verdant organic farm of the pope's summer home, or whip up one of the pizza recipes our Filipino chefs created just for Pope Francis. "It gives us immense pleasure to welcome Indochine Media's My Pope Philippines magazine to Magzter. We're quite confident that this inspiring magazine, which propagates universal values and life-transforming stories, will rapidly spread its wings across the globe with Magzter." - Girish Ramdas, CEO, Magzter Inc.
"My Pope Philippines is a one-of-its-kind magazine dedicated to Pope Francis, who is loved by millions of people across the world. The magazine spreads positivity with its coverage on everyday heroes and encouraging developments in the lives of Filipinos. Here's wishing My Pope Philippines to taste great digital success on Magzter!" - Vijay Radhakrishnan, President, Magzter Inc.
Magzter - Digital Magazine Newsstand 6.17 is free (with in-app purchases) and available worldwide through the App Store in the News category. 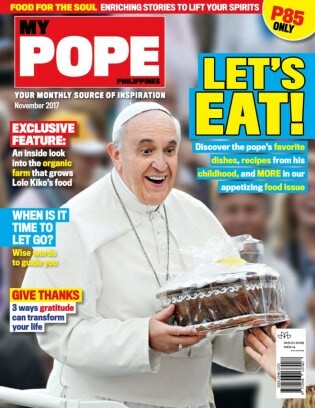 A monthly magazine, My Pope Philippines is priced at $9.99 (USD) for an annual subscription on Magzter. My Pope Philippines also comes as a treat to Magzter GOLD users, who can enjoy reading it along with 4,000+ other international digital magazines. The Magzter app is also available on the web, Google Play and is expanding to more platforms soon. Magzter's easy purchase and renewal systems ensure subscriptions are paid on time, eliminating the need for paper checks and postal mail issues. Users can buy their magazines on any of the above devices/platforms and seamlessly port their purchases to any other devices, a feature unique to Magzter. Magzter is the world's largest and fastest growing global digital magazine newsstand with over 35 million digital consumers, more than 9,600 magazines from over 4,000 publishers. Headquartered in New York, Magzter has its local offices in London, Barcelona, Amsterdam, Mexico City, Cape Town, Chennai, Singapore and Tokyo and will soon be expanding to other countries. Founded by global entrepreneurs, Girish Ramdas and Vijay Radhakrishnan in June 2011, Magzter enables magazine publishers around the world to create and deliver digital editions of their titles to global consumers. Powered by its proprietary OREY Click Publishing System(R), Magzter also enables their customers to publish interactive/audio-visual content in the magazine as it supports HTML5. Magzter launched Magzter GOLD subscription service to give digital readers unlimited access to thousands of magazines for a low monthly price. All Material and Software (C) Copyright 2017 Magzter Inc. All Rights Reserved. Apple, the Apple logo, iPhone, iPod and iPad are registered trademarks of Apple Inc. in the U.S. and/or other countries. Other trademarks and registered trademarks may be the property of their respective owners.